PUNE: Rich learnings in what it takes to grow and expand a business were shared at the SME ‘Founders Conclave’ organised jointly by the Mahratta Chamber of Commerce Industry and Agriculture (MCCIA) and the Indian Institute of Management (IIM), Ahmedabad. Centred around the theme ‘#worldclassinPune’, the event saw Sanjay Kirloskar, chairman and managing director, Kirloskar Brothers Ltd (KBL); R Gopalakrishnan, a former director of Tata Sons, and advisor MindWorks; professor Chitra Singla of IIM-A and Samit Vartak of SageOne, share their experiences and learnings on what makes a company successful and long lasting. In its centenary year, Kirloskar spoke of what it took for founders to create a company that has lasted this long and will continue for the years to come. “There are two lessons that I have learnt- one is that without taking risks you cannot grow, and two, without making mistakes you cannot learn. My great grandfather Laxmanrao wanted to be an artist and so joined the JJ School of Art in Mumbai. But there he realised that he was colour blind. So he did the next best thing, he learnt technical drawing. Since there were no jobs for people who knew mechanical drawing, he did the next best thing, he started teaching,” said Kirloskar. The fourth generation businessman from the Kirloskar family pointed out that Laxmanrao’s interest in all things mechanical was deep and he would subscribe to Scientific American and Foundry magazines. In 1888, he set up a bicycle repair shop and to boost his business he even taught people how to ride a bike. “But he saw the opportunity in making spare parts for agricultural instruments. In 1901, he sold this under the brand name Kirloskar Brothers. Probably, the first Indian brand. He went bankrupt twice, but still had people who had faith in him and invested in his business. Hard work and good luck go hand-in-hand to make a good company,” Kirloskar said. He recalled that he joined the family business in the eighties and learnt that to be successful, one has to think long term. “You have to communicate your vision very clearly to all your people. SMEs need to be successful, the country needs you,” he stressed. Professor Singla, however, spoke of the pitfalls in running a family business. “As in a family business or any other, it is important for founders to have a giving attitude. This means that they should not think only about the ‘self’. They should celebrate differences and settle conflict in the team through logical arguments. If an argument convinces you, you accept the other point of view,” she said. The IIM-A senior faculty also emphasised on clear communication. “I have often seen founders learn about what their children want to do from a consultant they hire. The other quality is empathy. This is the most valued leadership skill. Leaders should also be able to nurture talent and be transparent and fair about everything. These skills imbibed in the leader can help an organisation live long,” she said. 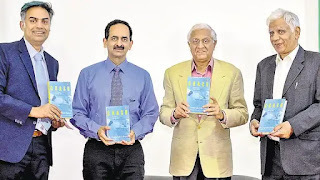 In the current scenario where startups and companies are eager to sell out to the highest bidder, R Gopalakrishnan author and corporate advisor urged startups and small and medium enterprises (SMEs) to reflect on what it was that shaped long-lasting companies like the Tatas, Hindustan Lever or Kirloskar. Gopalakrishnan, a former executive director of Tata Sons and director, Hindustan Lever Ltd delivered the keynote address and his book ‘Crash’ was launched at the event. “When I got a job, it was natural to think that you would retire from that company. But now the minute youngsters get a job their first thought is a startup. And a startup too thinks of selling out to the highest bidder. It is rare to find a company that has lasted long like the Tatas or Hindustan Lever or Kirloskar. Which makes me think what is it that makes a company last that long? It is important for startups and SMEs to understand this,” he said. Gopalakrishnan drew parallels with the human body to illustrate his points. “If you see the human body it has lasted for millions of years. What did it take? This body that we take for granted survived so many millennia because of its immune system. Our body is made up of 97 or so per cent moisture, x per cent human genome and maybe 10x per cent bacteria. Our bodies have a back up for the immune system in the form of white blood cells (WBCs). These are kept in store. There is redundancy followed by diversity. Besides WBCs there are leucocytes, B cells (bone marrow- or bursa-derived cells), T cells ((thymus cells) etc. Despite the diversity, there is harmony; each one does what it is supposed to do and that has been the Brahma-mantra for survival. Like a parent does not look at the value of a child say 5 or 10 years from its birth, the same way you invest in a company to nurture it,” he said. He said that long-lasting companies are consistent with their purpose. Jamshedji Tata wanted his company to be built for the good of people and this is what they do even today. Lever Brothers wanted clean the teeming millions and their Surf and Lifebuoy still do that. Be consistent, he advised. He urged SMEs to learn to organise themselves to deliver their long term vision. He cited the example of the GT road from Peshawar to Calcutta which, he said, was built not for just pedestrians or horse carts, but built to last. “Like nature learns to be adaptive and tolerant. In the nature animals, birds different species all learn to adjust to each other’s needs and live peaceably. Startups need to learn to adjust with each other’s and large corporations,” he said. He stressed that SMEs should be conservative with finances.